1. You can make them really personal – we give you the option of buying a voucher for a specific class, so you can pick something that’s perfect for your loved ones, from fishing and foraging to baking and butchery – whatever you think they’d enjoy the most. 2. Gift vouchers give people the excuse to treat themselves – because what is a gift voucher except money that you have to spend on something fun? You can’t save it for bills or groceries, you have to treat yourself to something really enjoyable. As well as vouchers for specific classes, we sell vouchers in denominations from £10 to £300, so you can let your favourite foodie peruse our website and pick something they’d really love to try. 4. …our vouchers also gift the lucky recipient some fantastic new skills, which they can use and enjoy for years to come. That’s pretty good value! Whether your loved one is a keen cook wanting to build on their existing talents, or a foodie adventurer who fancies picking up a new skill, we’ve got all sorts of options to choose from, from seasonal cookery masterclasses to smoking and curing your own meats. 5. Finally, when you buy our gift vouchers, you’re supporting a sustainable small business rather than a big corporation. At Vale House Kitchen, we do our very best to tread as lightly on the environment as possible, from the biomass boiler that heats our classroom to the brilliant local suppliers we use for our ingredients. Basically, it’s the exact opposite of the usual mass-market Christmas shopping. So there you have it – five great reasons to pick up a few of our gift vouchers this Christmas. Not to mention, of course, that they’re incredibly easy to wrap and perfect for posting! 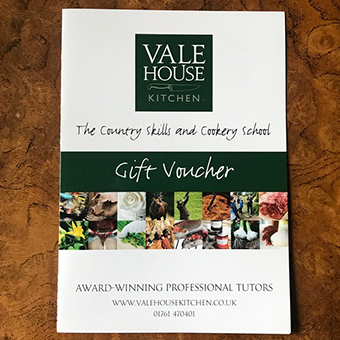 This year, don’t just grab any old rubbish off the shelves – spend your money thoughtfully on a gift that will never be forgotten, and give your loved ones the gift of a Vale House Kitchen experience. Click here to take a look….